Creation Lens Flares is an After Effects template that lets you easily create realistic lens flares and light effects for your footage, motion graphics, and images. 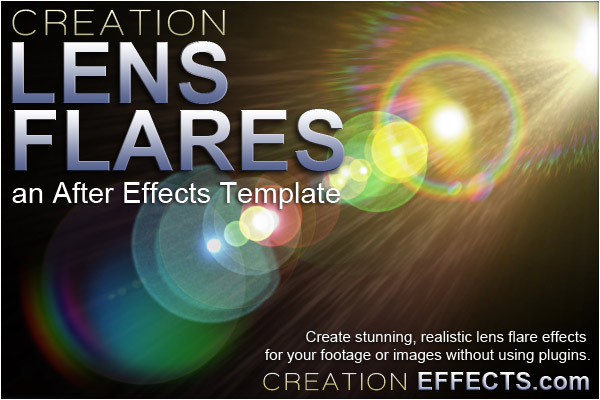 Creation Lens Flares is an Adobe After Effects template which takes a revolutionary approach to the creation of realistic, high-definition lens flares and light effects, which can be composited onto your footage, animations, motion graphics, photos, and graphic designs. The effects are all done entirely within After Effects, without using a single plugin. Included in the template are 50 pre-designed lens flares. Or, create your own unique designs by copying and pasting lens flare "elements" into your comp. You have a tremendous amount of control over how each element looks and moves using the easy-to-use slider controls on each layer. "Global" slider controls are available as well, so you can animate characteristics of your lens flare as a whole. See below for a complete list of features. Creation Lens Flares is compatible with version CS3 and later. No plug-ins required (except for the CC plugins included with CS3 and later versions).